Joseph A. Bozarth wrote his will on February 28, 1896. He died April 18, 1897, in Illiopolis, Sangamon County. I got it through IRAD because it less expensive. Also, the interns at IRAD are more experienced at finding the entire file. It’s their job. It is not the primary job of the Circuit Court Clerk. Documents from IRAD are generally copied in the format in which they exist, ie, double sided pages are copied double sided. Joseph Bozarth was born in Morgan County where he married Elizabeth Ann Henry and they moved to Sangamon County as did his brother William and his wife Lucinda Jones. William died on January 28, 1896, possibly prompting Joseph to write his will a month later. Elizabeth survived her husband as did two of their five children, Florence Bozarth and Eva Bozarth Wood. Eva was married to William Tobias Wood. Bozarth left his wife a life estate in his property. At the death of his wife and after paying all debts he left the remainder in two parts, “one part to Florence Bozarth without qualification, the other part to be invested in real estate for the benefit of Eva Wood, her heirs and assigns forever.” He intended it to be entailed forever. We also know from the probate that they were members of the Christian Church in Illiopolis which got $7.50 from the estate. It would appear that Joseph Bozarth did not think Florence would marry. He wanted to make sure Eva’s inheritance went to her children and not her husband – a totally unnecessary precaution since Eva outlived her husband by nearly 30 years but not an uncommon one. Elizabeth Henry Bozarth did not die for ten years, on February 7, 1907, in Kansas. Florence Bozarth did indeed marry, to a Nichols. She received notice of the final estate settlement by mail under that name. Unfortunately no address was given. There is no marriage in the Illinois State Archives database which may just mean she married after 1900. 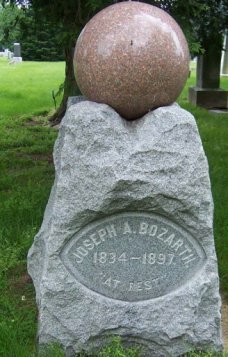 The Bozarth monument in Riverside Cemetery, Illiopolis, cost $184.15. Elizabeth’s plaque is on the other side. The final settlement of the estate did not occur until December 22, 1908. William Henry Downing’s probate file came from the Logan County Circuit Clerk. Parts of it could be found at IRAD and the whole probate would be in the FamilySearch files. On December 2, 1903, in the typhoid epidemic, William Henry Downing died. He was the only child of William Nelson Downing, who died in the Civil War, ironically of “typhoid pneumonia,” and Delilah Downing Downing. He was 40 years old, not expecting to die and had no will. The widow was named Administrix on December 8, 1903. David Shellhammer, husband of Delilah Downing Downing, and James Shellhammer, Delilah’s first son by her second marriage, stood as sureties. Appointed as appraisers were Lewis Upp, Charles Brooker and William Beckers, all three very close neighbors. Brooker would become the father in law of the eldest son Clarence. Upp was married to a Lincoln, descendant of the same immigrant ancestor as the more famous Lincoln. They finished up their work promptly and reported on December 28, 1903, valuing the property of the estate at $4,700.25. The list is four pages long and is quite specific at times – “6 rocking chairs, 1 bay mare named Brownie, 1 red steer, 1 gray mare, 66 hogs” – and less specific at others – “1 lot of chickens” [which I first read as “a lot of chickens”]. The value of the widow’s property as prescribed by law, which included school books, a sewing machine, beds, one fourth of a cow for every family member [fortunately for the cow there were four members], two sheep for every family member, one horse, etc., was $1,281.50. The Administrix reported on March 23, 1907. There was $4,700.25 in receipts which included $599.37 for “property not sold but kept…to make up amount shown on appraisement bill.” In the long list of bills totalling $3,704.76 we learn that funeral expense was $263.75 and the stone cost $1,140. The balance after all bills was $995.49, less than the widows’ amount. The land apparently passed separately. It is not mentioned. Each son received 80 acres which was farmed by son Ellis until the early 1970s. Most of it is now farmed by his grandson, Roy Downing. Delilah Downing Downing Shellhammer was the youngest child of Robert Downing whose probate was previously discussed. I had never considered that she had a will or probate but I found it in the probate records posted online at FamilySearch. These probate files are more work to collect, not being word searchable, but they are also free. Help with the records. Delilah died June 22, 1909. 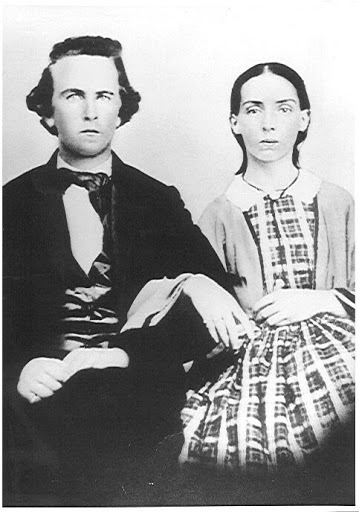 She first married William Nelson Downing who died in the Civil War. She then married David Shellhammer. 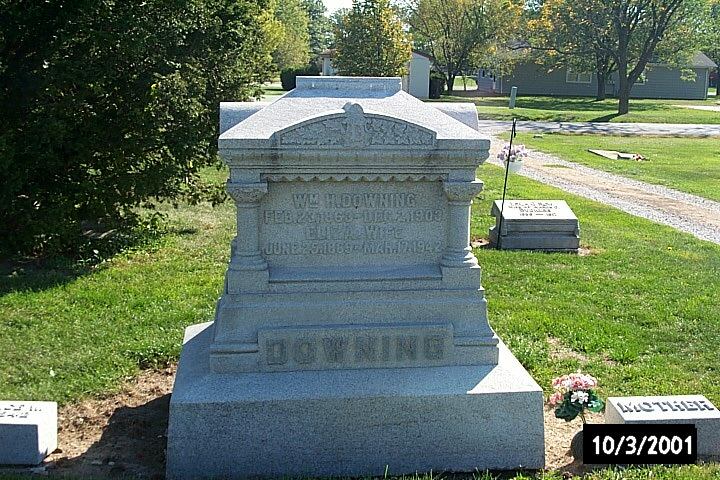 She had a son, William Henry Downing, by her first husband. 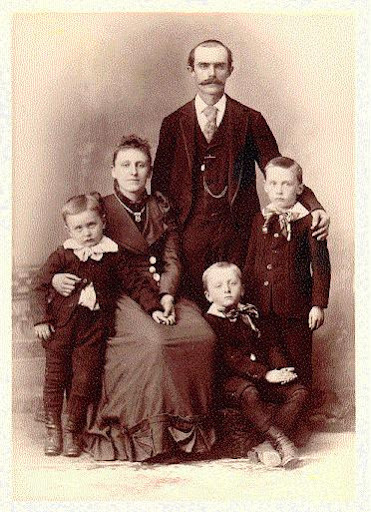 William Henry died in 1903 leaving four sons. She had two sons, James and Albert, and two daughters, Sarah Jane Shellhammer West and Augusta Shellhammer Park, by her second husband. On June 1, 1909, Delilah executed a will. Delilah couldn’t write and had to sign it with her mark. Whether Delilah couldn’t write or was too ill to write at the time is unknown. Delilah very carefully and specifically divided her property into fifths giving one fifth to each child and the remaining fifth to be equally among the heirs of her deceased son William. Her estate consisted of her personal effects and furniture and land in Section 1, Mt. Pulaski Township. She directed that one heir buy out all the others and that the others cooperate to do that. Finally she named T. A. Scroggin executor of her will. There were no claims against the estate. Everyone cooperated and probate closed November 1, 1909. Some of Delilah’s descendants should have taken a lesson from her will. This is the first of several planned posts on probate. This probate file was obtained in the standard way from the Logan County Circuit Court Clerk. 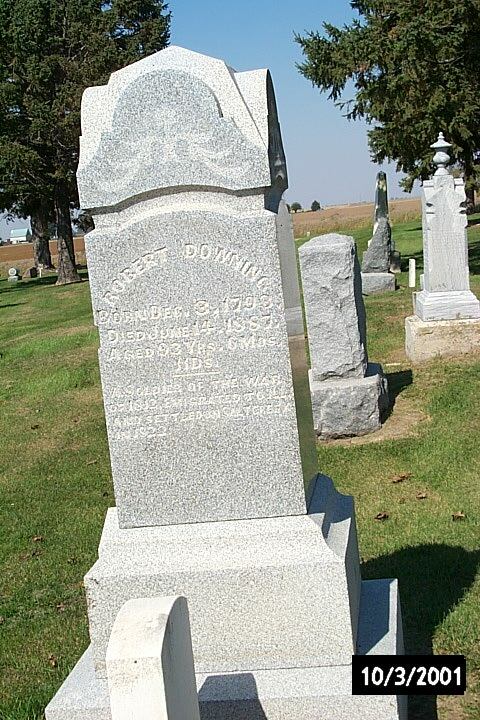 On June 14, 1887, Robert Downing died. 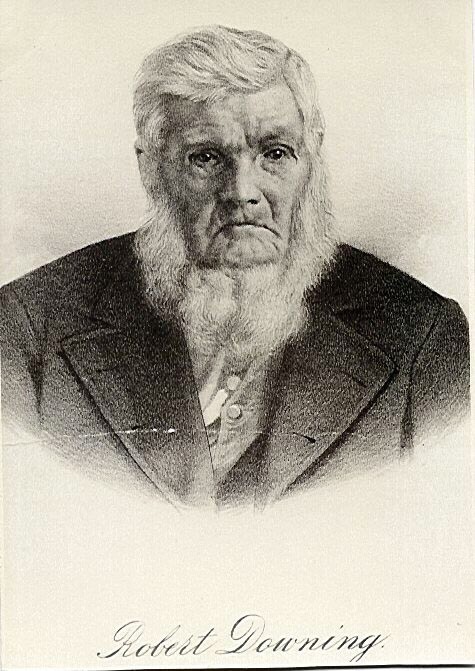 The War of 1812 veteran and one of the earliest settlers in Logan County, Illinois, was 93 1/2 years old. He died without a will. Letters of Administration were not issued to his eldest surviving son, Robert Harden Downing, until January 3, 1888. As he died with little money, no land and two of his daughters were given a lump sum by agreement of all other heirs it would appear he had carefully divested himself of most of his property, probably beginning after the death of his wife Jane Morrow Downing on May 16, 1882. The heirs of Robert Downing were the four daughters of his deceased eldest son John, son Robert Harden who was the administrator, daughter Mary Downing Roberts, son Lorenzo, son Alexander, the son of his deceased son Henry Clay, daughter Melita Downing Downing [correction added March 23, 2012] daughter Elizabeth Downing Downing, daughter Delilah Downing Downing Shellhammer. One child, Hannah, had died young. At the time of his death Robert was receiving a pension of $24, apparently per year, for his War of 1812 service. In the estate was an uncashed check for $24 which was characterized as “utterly worthless” as the government refused to pay it. Daughters Elizabeth and Delilah, the youngest of the children, were given $200 each which all of the other heirs agreed was proper so that they “might equally share the estate.” This seems to indicate the others already had their $200 at the time of death. Each heir signed off on the agreement. Their individual affidavits tell us where they were located at the time as well as their name. The stone for Robert cost $23.75. I would have to guess this is the “Father” stone at the side of the major stone for Robert and Jane. In the foreground is the War of 1812 marker. When all was said and done, exclusive of the $400 above, each of the eight heirs received only $53.28. The four daughters of John each received $13.32. Elizabeth died after her father but before the disbursement. Each of her eight children got $6.66.